"Getting in is easy. Getting out is a killer." 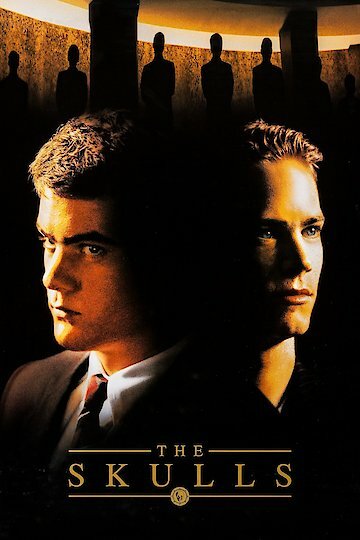 The 2000 thriller "The Skulls" chronicles the experience of college student Luke McNamara (played by Joshua Jackson), who is invited to join an exclusive, secretive society called The Skulls. Luke is excited, since this connection will help with his goal of getting into Harvard Law. When he becomes a member, his best friend Will (Hill Harper) strongly disapproves and begins conducting research on the Skulls. In the meantime, Luke becomes friendly with Caleb Mandrake (Paul Walker), whose father, played by Craig T. Nelson, is the current chairman of the society. As strange events begin occurring, Luke becomes troubled by the influence of the organization and begins to fight back, with frightening consequences. The film, which is rated PG-13, was critically unsuccessful but quite popular with audiences, spawned two sequels and grossed about $35 million in the United States. Two of the young stars, Jackson and Walker, went on to successful film careers. The Skulls is currently available to watch and stream, buy on demand at Amazon, Vudu, Google Play, FandangoNow, iTunes, YouTube VOD online.